EXCLUSIVE: New Cinematic Nighttime Show at Universal Orlando Will Celebrate ‘Harry Potter’ & More! This Summer, Universal Orlando will debut a brand new nighttime lagoon show in Universal Orlando’s Cinematic Celebration. 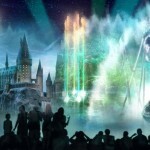 By using state-of-the-art technology Universal Orlando’s lagoon will be enveloped in an immersive cinema experience, including moments and characters from the Harry Potter series. We spoke to Mike Aiello, Universal’s Senior Director for Entertainment Creative Development, who explained to us exactly what we can expect from this new experience. We heard some great details on the Potter section of the show (our goosebumps are officially here to stay), so keep reading to find out more! UPDATE (07/18/18): Watch the full show at the bottom of this piece! The show was announced late last year, but new details revealed by Universal in an exclusive press release are making us suspect that there might be a few charm-savvy wizards working in Universal’s creative department. Combining the effects of 120 dancing fountains with special effects and technologies, the show will make use of”full panoramic water screens accented by additional multi-layer water screens”, as well as pyrotechnics off of buildings and projection mapping, all complementing the media shown across the lagoon. The lagoon and surrounding buildings will be transformed to showcase Universal’s titles, including moments from Harry Potter, Jurassic World, The Fast & the Furious and Despicable Me. The show sounds mega-futuristic, but we’re not sure how all this amazing muggle technology will cope, what with the show being held just outside the entrance to the Wizarding World! Universal Orlando premiered their Wizarding World of Harry Potter evening spectacular, The Nighttime Lights at Hogwarts Castle at A Celebration of Harry Potter this year in Universal’s Islands of Adventure, and guests will be able to access a variety of special offers to see both new shows, including a 2nd Day FREE offer exclusive to Florida residents (more information at Universal’s website, here). What can we expect from this show? Mike Aiello – Senior Director for Entertainment Creative Development at Universal Orlando – shared his vision with us in an exclusive interview, conducted by Leaky editor, Kim McChesney. “This new show really is a culmination of a guest’s day at Universal Orlando. It will feature various brands and characters and music and moments – all the things our guests experience while they’re here, as well as some things that exist within Universal’s [movie] catalogue. As guests watch the show, they’re going to see about 2 minute sections of a lot of the characters and brands they’ve seen while they’ve been here. “This is also actually the first time that we’re going to feature the Wizarding World outside of the land. 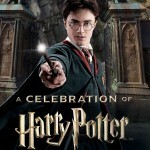 There will be a two minute section devoted to the brand that is Harry Potter. That section itself is primarily driven by spell casting, because when the guests are at the park, the one thing that they’re able to do to connect them directly to the brand is purchase a wand and use that [within the Wizarding World sections of the park]. “These films have amazing visuals. To be able to show Harry flying through the air on the Hippogriff, but on a water media platform that is extremely wide, we show that image in an epic way – different to when you see it in the movie theaters or at home on your TV, and with the aid and support of John Williams’ music theme, accentuated by fountain programming and pyro[technics] in the background. “It’s something we haven’t been able to do outside of the ride attractions. There’s a moment where you see the New York facades start to freeze, and we know what happens when things are freezing! It means Dementors are near. There’s a Dementor moment that will happen over the water, and of course the culmination of that is Harry appearing in the end, and casting ‘Expecto Patronum’! “Traditionally our nighttime shows have been across the entire lagoon, and our guests have surrounded the entire lagoon, so their engagement with the show really depended on where they were standing. We’ve changed that with this one, and completely reconfigured our central park area, which will now be tiered viewing to occupy about 6500 people at a time. Thanks to Universal Orlando and Mike Aiello for sharing these exciting details! Universal Orlando’s Cinematic Celebration show is in its final stages of tech production, and will debut this Summer, so stay posted for an exact date. Will you be first in line to see this new show? Let us know in the comments, or via our Facebook, Twitter or Instagram! According to Matt Dobrovolsky, this might just be the best show at any of the theme parks in Florida! Check out his video below (Harry Potter segment begins at around 14:04), and see more stills in his piece here.